Browser attacks are one of the most common attack on internet as we all know.Hackers love these kinds of simple and quite effective attacks that can be simply performed without using much resources and give maximum output to them. As we all feel it boring to re-enter password again and again on sites that we open several times a day so normally we save our passwords in our browser itself and Hackers can take advantage of it to steal our personal information. 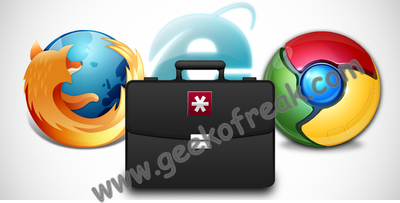 1) Avoid saving your passwords in your browsers so that no one can steal it. 2) Start using a master password in browser (For mozilla users). 3) Whenever logging in to any site check and confirm the URL to prevent phishing attacks. 4) Check URL’s SSL certificates (Normally HTTPS). 5) Always delete your history and cookies after using your accounts on public systems and regularly even using your own system. 6) You can also use certain softwares regularly and automatically perform this task of cleaning . e.g.> Ccleaner , Tune up utilities etc. 7) Use updated and a genuine antivirus in your system to avoid malicious attacks. 8) While using wifi on your system make sure that connection is trusted (It is automatically displayed by windows defender). 9) Never download browsers using torrents. Instead prefer downloading it from their official sites as it is always free and updated. 10) Use updates browsers for more security. 11) Install different add-ons provided by antivirus organisations to have a quick view of the links. e.g.>McAfee , Avast , Kaspersky Add-ons. Bonus Tip: Use a dedicated password manager, like LastPass. What Is Phishing Attack and How It Works. ← What Is Phishing Attack and How It Works.